(Los Angeles, Ca., March 2, 2017). Today, Larry Klayman, the founder of both Judicial Watch and now Freedom Watch and a former federal prosecutor filed a complaint before the U.S. District for the Central District of California (Case No. 2:17-cv-01705), alleging that the ACLU, the Council for American Islamic Relations (CAIR) (which was previously named as an unindicted co-conspirator in a criminal terrorist trial in Texas), Barack Obama, George Soros, and former Attorney General Eric Holder, whose law firm represents the ACLU in various matters, and other named defendants all conspired and acted to further violent protests over President Trump's initial executive order to implement a 90-day moratorium on immigration for 7 predominantly Muslim Middle Eastern countries. As a result of this alleged incitement to violent protests, the complaint alleges that Klayman was assaulted by a Muslim woman in the baggage claim area of Southwest airlines. Just weeks earlier a terrorist attack had occurred in the baggage claim area at Ft. Lauderdale International Airport, killing and severely wounding several travelers. Klayman, the complaint alleges, thus believed at the time of the assault at LAX that he and others were under terrorist attack and about to be killed or severely harmed physically. 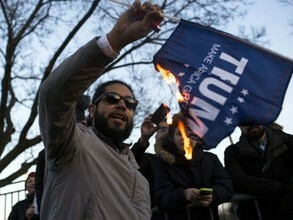 During the time of the protests of President Trump's initial immigration order, the ACLU, allegedly whipping up violent protest in concert with other defendants, raised reportedly over 24 million USD in just one weekend, profiting from its alleged illegal actions. The complaint thus alleges that this was in effect a racketeering enterprise. Klayman had this to say upon filing the complaint: "The ACLU, CAIR, Obama, Soros and Holder and the other defendants must be held to account for their actions, in my opinion designed to destroy the Trump presidency to further their socialist and pro-Muslim agendas. I got caught in their crossfire. I therefore will not stand by and allow the nation to be destroyed by these leftists who have no respect for law and order! My complaint asks for over ten million USD in damages, as well as punitive damages for these malicious acts to prevent this from happening again."